If you live in America, there’s roughly a 30% chance that you have either diagnosed or undiagnosed diabetes. That’s a pretty high number! This is largely due to the efforts of large food manufacturers and conglomerates to boost sales revenue while cutting production costs, by adding high doses of corn syrup, high fructose corn syrup, and sugar to mainstream food items. Heck, in America, even our bread has sugar in it! The problem is that excessive sugar consumption is a key cause of diabetes—and for diabetics, avoiding high fructose corn syrup and other added sweeteners is a necessary part of maintaining healthy blood sugar levels. Even intake of foods high in simple carbs, such as pasta and bread, needs to be moderated. So it goes without saying that your diabetic snacks won’t be including many Skittles or Ho-Hos! So what foods can you use in low carb snacks for diabetics, if you want something tasty, filling, nutritious? Hummus Makes Great Diabetic Snacks! Thankfully, hummus is one of the best diabetic snacks around. In addition to being packed full of diabetes-friendly complex carbs, protein, heart-healthy monounsaturated fats, and vitamins and minerals, hummus has a super low glycemic index! The American Diabetes Association recommends a 1/3 cup serving per day, preferably with vegetables to round out a filling and low carb snack for diabetics. And as long as you’re checking out how healthy this “wonder dip” is, you may want to take a closer look at the brand label—because many popular hummus brands are not as healthy as they’d like you to think. Just like so many other foods, hummus can be laden with preservatives and low-quality conventional ingredients, treated with high heat, and full of unhealthy oils that are cheaper than real extra virgin olive oil. So once you’ve picked out your favorite HOPE flavor, it’s time to whip up some tasty diabetic snack recipes! 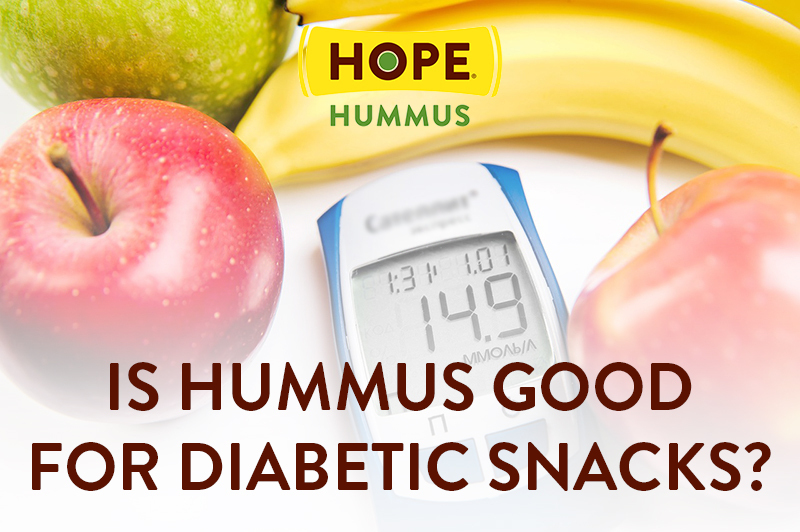 These are just the tip of the iceberg… let us know how you incorporate delicious and healthy HOPE Hummus into your creative diabetic snacks!